Clearly I like to create and decorate, but I'm not a big DIY Christmas Ornament maker. Today, however, that changed. I had about 10 spare minutes....I kid you not, that actually happened. Somehow between two kids, two snowdays, a minor medical procedure, the craziness of Christmas, and filling countless Etsy orders I actually had a few minutes to create. Anyway, when you have 10 free minutes, a scrap of burlap, and a small wood embroidery hoop, what do you do? You make your own ornament, of course. At least that's what I did...and it was so easy which makes it that much more exciting. First I designed the ornament in PicMonkey. Don't be intimated by "design" because by that I mean I opened up the free photo editing software, I clicked "Design" and picked 4 x 6. I took it up to 100% view picked a wreathery design I liked and added a V. That part took me about 2 minutes. I saved it, downloaded to my computer and reopened the file in Powerpoint. I only did this so I could control where on the page I printed it. See, I only had this scrap of burlap so I needed the image to print on the left. TIP: To print on burlap, just use an iron to adhere it to a piece of freezer paper that's been cut to the same size as standard printer paper...you can see I reuse my freezer paper over and over again until there is so much burlap fuzz on it it will no longer stick. Once the freezer paper is on the burlap it's time to print out the design. DO NOT CUT OUT YOUR DESIGN YET. First, take apart the wooden cross stitch hoop. Put the full circle (the one without the screw) under your burlap, place the burlap on top and then add the second piece of the ring. Tighten the screw and then cut the burlap. This makes it far easier than trying to cut the piece first because you run the risk of making it too small and it won't fit in the hoop. 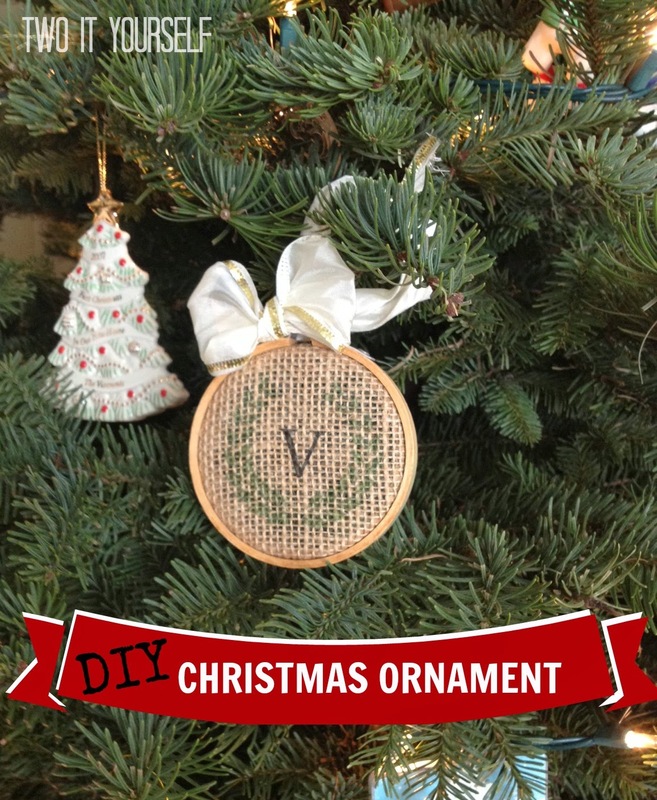 You could add a hook and hang it on the tree like this, or you could do like I did and tie a pretty bow out of ribbon you have on hand and call it a day - or better yet, a DIY monogrammed Christmas ornament. If I were to do this again and use the same wreathery design, I would make it a darker green (done in PicMonkey) becuase it doesn't show up as well as I would like on the burlap. Wouldn't these make awesome gifts for teachers or neighbors - you could even use them as gift tags!